Women understand that the integration of advertising into the video-viewing experience is a necessary part of the business model and does not have a negative impact on the viewing experience as long as the advertising is targeted, has an appropriate ad-to-content-length ratio, and does not impact or slow down the viewing experience. As part of the POPSUGAR Insights/ulive 2014 lifestyle video study, we asked women to detail when advertising would appeal to them while watching lifestyle videos online. 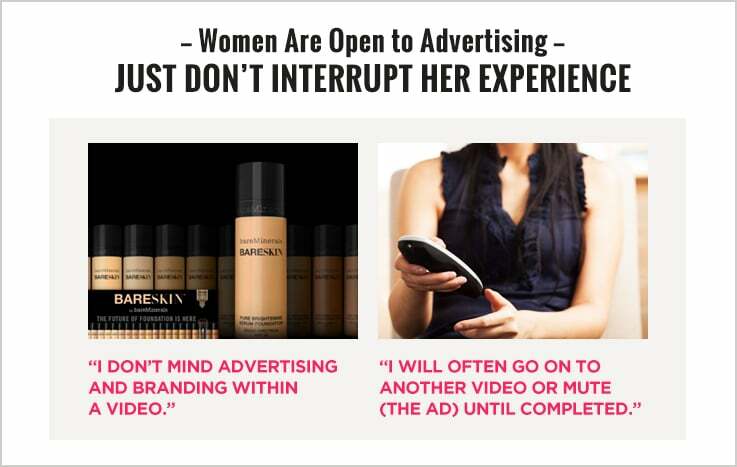 In general, women seek ads that don't interrupt the viewing experience (47%), don't delay viewing (43%), are from brands that women are interested in (37%), and are related to the content they are currently watching (34%). For sites that do not target appropriately or do not have an appropriate ad-to-content-length ratio, women have discovered work-arounds that negatively impact ad viewability. Heavy lifestyle video consumers are especially focused on how advertising impacts the quality of their viewing experiences and are more open to native video advertising solutions than moderate viewers. Fifty-nine percent of heavy video consumers say advertising appeals to them when it doesn't delay their viewing of the video, while 50% say it appeals to them when it doesn't interrupt the viewing of the video. Heavy consumers are more likely than moderate consumers to say advertising is appealing when they are able to pick the ad they want to see, when the products advertised fit with how they want to live their lives, and when the ad is integrated into the video.